So far, this is turning out to be an unsatisfactory week. I'm not sick, and nothing in particular has happened: mostly I'm just really tired, like, the sort of tired that normally only happens during the week after a Daylight Saving Time switch. Election years tend to be hard on me. Particularly terrible were 2004 (the year all Republicans ran against the state of Massachusetts and/or gay marriage) and 1998 (the year all politicians, Democrats and Republicans alike, ran against Ellen DeGeneres). This one's not looking good either,1 and the recent string of suicides by young gay men and teens hasn't helped. There are worse things to be than gay, this election cycle. The house hasn't been foreclosed on, nobody's lost a job, we both speak English, neither of us are, or could be mistaken for, Muslims. However bad of an election year this is to be gay, it's way worse to be Muslim. But even so. The election is making me tired, and anxious. Also I'm not sleeping well, as of the last three nights (though that has more to do with indigestion than the election), and the not sleeping well is also making me tired, as not-sleeping will do. Therefore, colorful pictures of pineapple flowers. 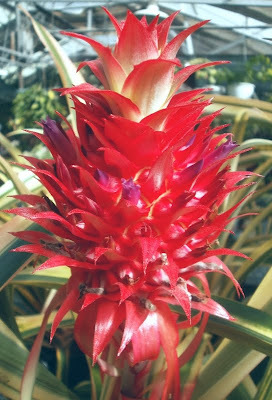 I don't know whether pineapple flowers require commentary, but if they do, I can't come up with any, so think of something really cool and funny, the kind of thing a well-rested person with no worries would say, and then imagine I said it. 1 There's at least a decent chance that some of the Iowa Supreme Court justices who wrote the pro-gay-marriage decision in Varnum v. Brien last year are going to be recalled: to put this in perspective, no judges have ever been recalled in Iowa since the state adopted the current recall system in 1962. The reason it's close this time is that the bigots are out to punish the judges for the Varnum decision, and they're getting lots of money (from the Mormon and Catholic churches, primarily, though not exclusively) to convince people to recall. If the judges are removed, it doesn't change the law -- you need a constitutional amendment for that, and it's hard to change the Iowa Constitution, requiring multiple large-majority votes -- but it's a signal to the other judges. If you like your job, rule the way we want you to. If the judges are recalled, then the governor -- who will almost certainly be Iowa Governor For Life Terry Branstad (governor from 1983 to 1999, and very likely also 2011-2015), a Republican, will be the one to choose their replacements. Branstad's been kind of coy about gay marriage thus far, not making it a central campaign issue. What he has said on the matter falls somewhere between not encouraging and downright incoherent. In the event, I'm not sure what would happen if the Iowa Constitution were amended to officially exclude gay marriage, whether the husband and I would remain married under the law or not. The precedent from California suggests that we would, but California didn't change their constitution over it, either, so who knows. Even if it didn't affect me directly, it still wouldn't be fair, obviously. I have trouble imagining how hard it must be to be gay in most parts of this country. I have trouble understanding why it upsets so many people. Really, your marriage is so NOT a threat to my (heteronormative) marriage. What you do in your bedroom has absolutely no affect on me as long as everyone involved in a consenting adult. Why do politics get focused on this type of issue instead of, oh, the "war" in Afghanistan or the environment or solving real problems in this country. Turn off the news. Walk away from the paper. Vote and tell everyone you know (especially those of your political persuasion) to vote. The bigots get to me this time of year, too. I'll second Diana. I'm tired and disgusted and horrified at the current state of public discourse and the way it leaks over into day to day life. And I don't even have a TV - no direct line to the poisonous drivel and rampant bigotry. So you're not alone. Stupidity and gratuitous outrage are in greater fashion than ever, agreed. I suggest kava, chamomile tea, and a day or more without news or as little as possible. I need to take mental health vacations like that once or twice a year. Being an xbox fiend helps distract, too, but I wouldn't actually recommend that to anyone. By some measures, Johnson County IA is an unusually good place to be gay. Lots of gay people and gay couples in Iowa City, the state has gay marriage (even if only temporarily), I think the state also has anti-bullying laws and employment/housing non-discrimination laws (though that might only be the county). I mean, compared to a lot of people, the husband and I have a really cushy life, so I feel whiny for even bringing the subject up: I imagine a lot of people would kill for what I've got. But knowing what's going on elsewhere is still hard, and it's harder because I really can't do that much about it. Particularly in the cases like the suicides, where there's not anything anybody can do about it. We have a TV, but haven't had cable since June. It turns out the internet is more than enough to depress you, if you're interested in what's happening in the world at all. I probably should make more of a point of getting away from the news when I feel like this. Part of my brain always thinks that if I just learn more about what's happening, if I can just gather enough information, that I'll figure it all out and know how to solve the problem. Or something like that. I'm not sure what my brain actually thinks it's going to do with all the information, just that it always feels extremely important to collect it. And media reports and blogs and etc. certainly look like information. So it's harder to get away than it should be, because I have to fight my usual habits and instincts to do that. I can't think of anything to say that would be cheerful, or reassuring, or funny. All I can come up with is some unsolicited advice, namely, get out of the house and take long walks with Sheba. The weather is getting cooler, so you should feel better, and exercise is one of the (free) things that's really good for depression. I know you're not much of an outside gardener, but looking at other people's gardens should be cheering. Also, a long soak in a hot bath before bed can be very helpful in knocking you out for the night. With respect to politics I can't cheer you up. I have come to the point where I can't believe that six billion pack apes are ever going to behave nicely to each other. I assume that, like in Britain, there are telephone helplines (and Internet etc.) for the young gays who can't yet run away to the big city? Fewer people need to do that now but it should be taught in school that it is an option. That there is always another option. It may also be just this time of year. I spent all last night drifting in and out of consciousness. I eventually gave up and just got up to eat. Apparently there is also a Fox News North in the works. I've signed petitions to prevent it. It would be funded by increased cable fees. Argh. Please don't spill over up here. I follow a lot of rights news and sometimes it's really depressing (towleroad). I don't understand how things can be so different just across the border. I'm so lucky to have been born in Canada. The world is a strange place. An uneducated opinion is not a valid one. Regardless of what society tells you. I guess. I've put off watering the plant room for two days (combination of not wanting to and most of the plants still being wet from last time), so today, at least, I really don't have time to do much else, alas. Though that's good, insofar as some of the insomnia is due to taking some afternoon naps I shouldn't have taken. I don't know how much publicity it gets in the schools (in some parts of the country, distributing the number of a gay-specific suicide hotline would attract protest in the guise of "schools shouldn't promote homosexuality"), but there is at least The Trevor Project, which includes suicide prevention, among other things. The recent string of suicides has also prompted the It Gets Better Project, which is basically a bunch of grown GLBT people sharing their experiences of life improving after high school, via YouTube. As with any effort to encourage people to hope for the future, it's drawn a lot of criticism as well, particularly from the left, though it's not entirely clear to me what the critics object to about it. For me personally, the IGBP would have been a godsend in high school; I had to convince myself things were going to improve by reading lots and lots of books, and talking to a few actual adult gay people directly. Fortunately both were available to me, but not everyone would be so lucky. I haven't seen this specifically, but I've seen people get upset over less. Yeah, you're getting a lot of our bad copyright habits too. And let's not forget the recent thuggish unpleasantness in Toronto. I dearly hope that Canada remains thoroughly Canadian, because I like thinking that there's somewhere the husband and I could move to, if things were to get desperately bad here. Another part of me thinks that this is like the frog-in-slowly-boiling-water thing, and things have already gotten desperately bad here. I feel we're in the midst of major societal/cultural/political changes; the kind that most people refuse to contemplate. I think it's important to remember that most of these logically challenged people have always been with us, the internet has just given them soapboxes that are harder to ignore. But the internet is one of the greatest inventions, ever, because all these people proudly wearing their Tinfoil Hats are slowly learning that every posting, tweet, video is eternal, and we get to watch them backpedal and spin themselves into corners. I have been so tired this week, I wonder if it's contagious. While not exactly cheering, it is very encouraging that so many people have done videos and posted. Many of them I've watched so far are very moving. And I too wonder if we are sitting in the pot of boiling water. It's not just that the internet gives them bigger soapboxes; they also have a major "news" station blasting their ideas 24/7 and organizing events for them (the Tea Partiers didn't come up with all this stuff on their own), and a number of well-funded right-wing think tanks and whatever. I mean, there's a whole industry built around promoting right-wing ideas, and the ideas being promoted have less and less grounding in reality. Though you'd think that cognitive dissonance would kick in at some point, I'm pretty sure that if it hasn't by now, it's not gonna. I haven't actually watched many of the videos, but I was aware of the project, and approve of it. There was a new moon last night, the days leading up to it have been, well, edgy, to say the least. Full moons take the limelight because of werewolves and all, but new moons shouldn't be underestimated in terms of their effect on human spirits. They are powerful. Sometimes I'll encounter someone who thinks there's no connection between our human emotions and the phases of the moon. I'll ask if they believe the moon influences the tides, and when they say yes, I'll point out our bodies are mostly water, so why wouldn't the moon influence us in ways we don't understand but we can feel? I'm like, duh. The universe is not stupid...just some humans are, and they're being whipped into a fear frenzy and it's shameful. But there are a LOT more people who appreciate the planet we're all on together and the power of the moon and the stars. And of course, the power of compassion for each other. That's my way of saying, I think it'll start getting better soon. It's good that you wrote what you were feeling instead of forcing something else. That's how you make the world a better place. You're doing an excellent job of that, mr_s, so thanks. Well, that's . . . a theory. I have no doubt that I'll feel better at some point. When you're feeling worse than average, it's pretty much dead certain that at some point later you're going to improve to at least average. When things are awesome, inevitably, everything's going to level back out to average again. It's a very obvious and unromantic sort of thing to say, but it's comforted me before. I'm not convinced we're in boiling water. I'm trying very hard to take the optimistic viewpoint that all of this ruckus and hullaballo is a sign of imminent change. I think some people are being so loud because they are afraid of change. They're screaming in fear. Remember that the California ban is possibly not going to be upheld. Didn't a judge recently rule it unconstitutional? You know, I'm W.A.S.(raised)P. and I HATE election years. So much venom and hatred spat out at everyone and everything. I pretty much become an ostrich. I get my head out of the sand long enough to educate myself on the issues and pick what candidates seem the least evil. Ctulu for Congress. He seems like the most reasonable choice.